Price: $1.99 (as of 06/30/2015 at 5:00 PM ET). Growing up on the mean streets of New York City, Johnny and Mikey always had each other's back. Mikey was a loyal friend, but even he knew that Johnny was headed for bigger things. 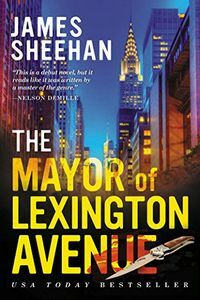 That's why he dubbed him the "Mayor of Lexington Avenue". The two friends were inseparable — until one fateful night set them on their different paths: Johnny to life as a high-powered lawyer in Miami, and Mikey to a shattered existence behind bars. Now, haunted by guilt over Mikey's conviction, and numbed by the excesses of a successful life, Johnny finds his one last shot at redemption: A young Florida man is framed for a murder he didn't commit, and Johnny feels compelled to fight for him — and, in a way, for Mikey. But there are powerful people who want the truth hidden, and Johnny will have to risk everything and everyone he cares about to save the young man … and himself.